Metropolis by Gordon Fitzell at the Strata New Music Festival. Revolution Ensemble performs for GroundSwell in Winnipeg at the University of Manitoba Desautels Faculty of Music. Revolution Ensemble is an experimental group dedicated to pushing physical and musical boundaries through exploring improvisation, graphic scores, electronics and interdisciplinary collaborations. Based in Montreal, the core members are Gordon Fitzell and Tommy Davis, who invite other artists on a rotating basis to perform for specific project-based performances. 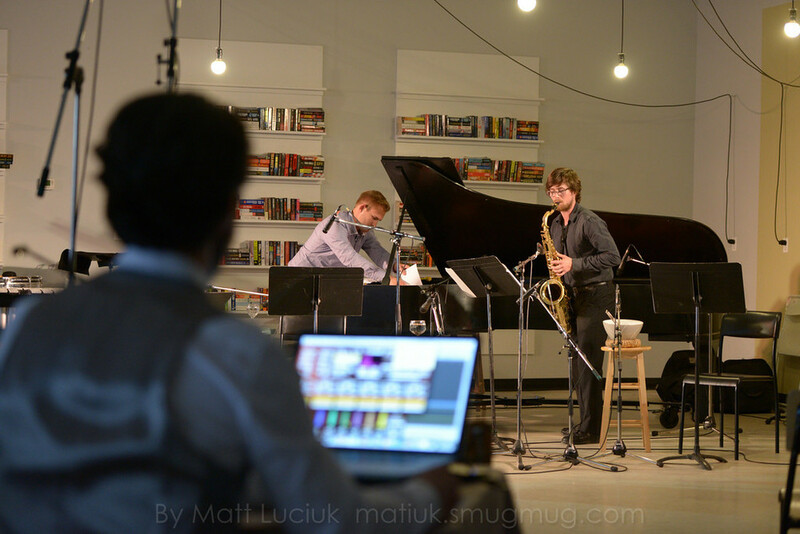 They have collaborated on performance projects in Canada, France and the United Kingdom including the Strata New Music Festival (Saskatoon), GroundSwell Winnipeg, the Huddersfield Contemporary Music Festival (UK), Sonorities Festival (Belfast), and the World Saxophone Congress (Strasbourg). r/evolution is a moto perpetuo work featuring uncommonly long phrases, trajectories and transformations. The piece requires extended circular breathing and the virtuosic execution of multiple simultaneous performance techniques. These techniques include multiphonics and other false fingerings, whisper tones, vocalizing/growl, pitched key clicks, and a blended teeth-on-reed embouchure. Fluidity of co-presentation and transformation across these techniques is essential to the continually evolving character of the work. 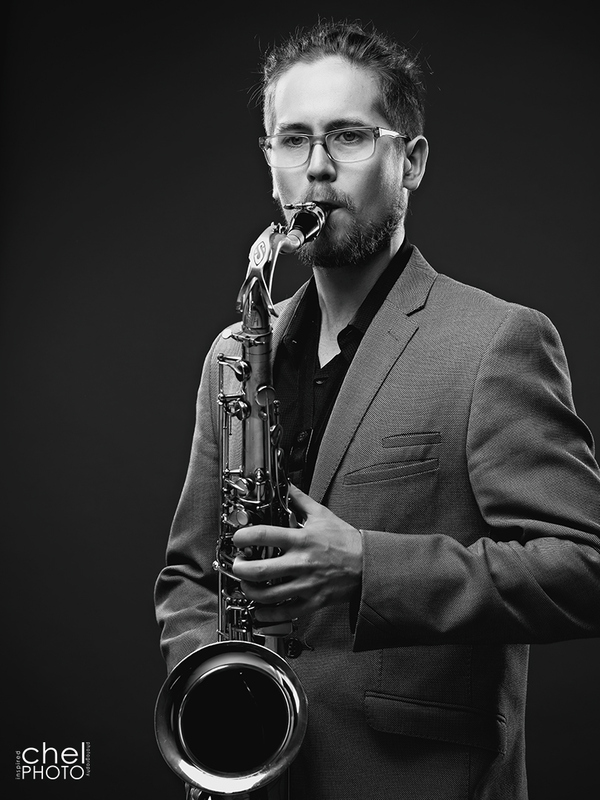 Commissioned with the support of the Manitoba Arts Council, the work is dedicated to saxophonist Tommy Davis. The score for Metropolis combines manipulated photographs with graphic notation and elements of conventional music notation. Each system of music features a different colour scheme, which, together with intervallic, gestural and sectional indications, constitutes an important synaesthetic component of the piece. 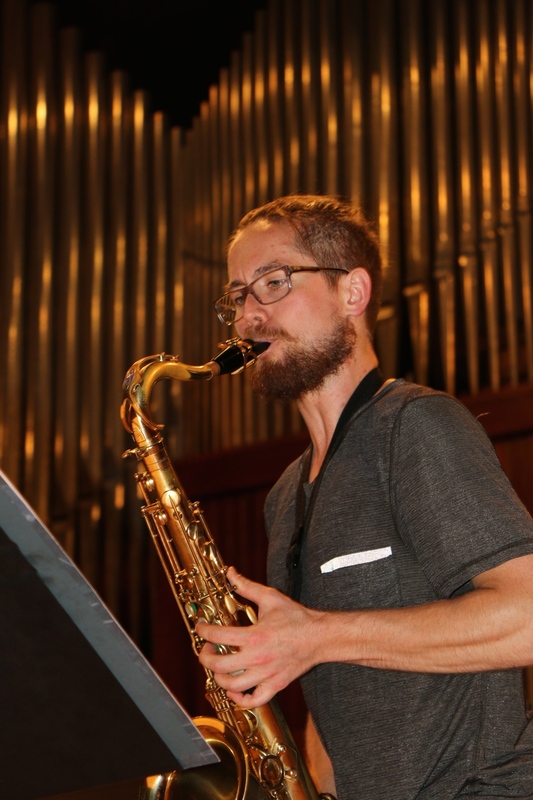 The work was commissioned through the Manitoba Arts Council by saxophonist Allen Harrington and pianist Laura Loewen, who in 2006 were the first Canadian finalists in the world’s most prestigious saxophone competition—the Adophe Sax International Competition in Belgium. Metropolis appears on the album Metropolis (Parma Records, 2014) by the Harrington Loewen Duo. A mobile art installation for five sonic luminescent orbs, :spin explores the concepts of spatiality and energy transference through the use of multiple ambulatory sound sources. This approach affords each listener a unique auditory and visual perspective on an ever-changing immersive environment. The work was first installed at the Lisbon Architecture Triennale in Portugal in 2007, where it ran for two months. It has also been presented at the Cluster New Music + Integrated Arts Festival, the Winnipeg New Music Festival, and at the ISCM World Music Days in Bruges, Belgium. Multiple microphones signals are processed in real time to create an expanded and immersive listening environment. The electronic version of r/evolution was premiered at the 2016 Huddersfield Contemporary Music Festival in Huddersfield, United Kingdom. This work earned First Prize in the electroacoustic category at the CBC Radio National Competition for Young Composers in 1999, and Second Prize at the 1998 SOCAN Awards for Young Composers. It has received numerous national and international performances and broadcasts. An earlier version of !Zip, entitled Zipper Music II, appears on the 2000 2-CD set Présence II (CEC). In economics, food product formulation and many other enterprises, the term “bliss point” refers to an optimal quantity of consumption beyond which any further increase would diminish quality. In adapting this concept to music, I opted for a design that challenges the performers to choose the duration that best expresses their interpretation of the work—the sonic bliss point. Dedicated to Sea&Sky, Bliss Point appears on their self-titled 2015 album Sea&Sky.